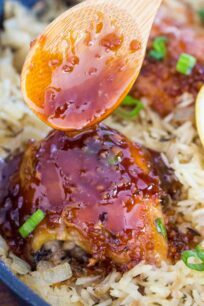 One Pan Honey Garlic Chicken and Rice is sweet and savory with tender chicken baked with flavorful rice. This is a restaurant quality meal made easily and conveniently at home. Season the chicken on each side with some Kosher salt and black pepper. Heat the cast iron skillet on high heat, once hot, add the canola oil. When the oil starts to slightly simmer, add the chicken, (skin side down if you are using skin on chicken thighs) and cook until browned, 4-5 minutes on each side. Transfer the chicken to a plate and cover well with foil. Add the garlic to the cast iron skillet and cook for 1 minute, just until fragrant. Add the honey, water, vinegar, ginger if using and soy sauce. Cook on medium heat until the sauce reduces down and thickens slightly (about 5-8 minutes). Stir occasionally. If you want the sauce thicker, cook on low for longer, stirring occasionally. Add butter to the hot cast iron skillet and melt on low-medium heat. Add the diced onion and cook for about 1 minute, just until soft. Add in the uncooked rice and dried thyme, stir and cook for a minute. Add the meat back to the pan, on top of the rice. Skin side up if using bone-in thighs. Cover with foil and bake for 45-50 minutes. When 5 minutes are left, uncover the pan, brush chicken with the sauce and broil for 5 minutes. Serve with lemon slices, fresh parsley and extra sauce on top of the chicken.